What does ET stand for? What does ET mean? 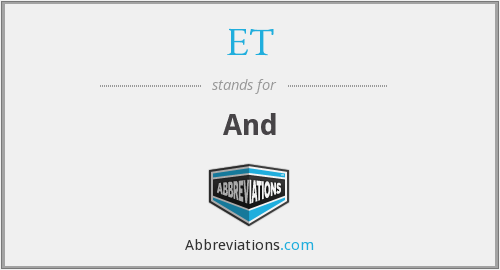 This page is about the various possible meanings of the acronym, abbreviation, shorthand or slang term: ET. .et is the country code top-level domain for Ethiopia. "et" is also the French and Latin word for "and", which would permit many domain hacks if it weren't for the fact that second-level domain names aren't sold. Registrations are made at third level. Couldn't find the full form or full meaning of ET? ESY - ESYA - ESYN - ESYNCSECURITY - ESZ - ET (CFSAN) - et al - et al. - et seq - et seq. Know what is ET? Got another good explanation for ET? Don't keep it to yourself! "ET." Abbreviations.com. STANDS4 LLC, 2019. Web. 20 Apr. 2019. <https://www.abbreviations.com/ET>.